Answer: It’s still an active topic in some circles, but NASA has pretty much debunked it. The image at left is the infamous “Face on Mars.” It was photographed by the Viking 1 spacecraft as it orbited Mars back in 1976. It looks like face, no question. But when the shadows are cast in a different direction, the appearance of the topography changes dramatically. 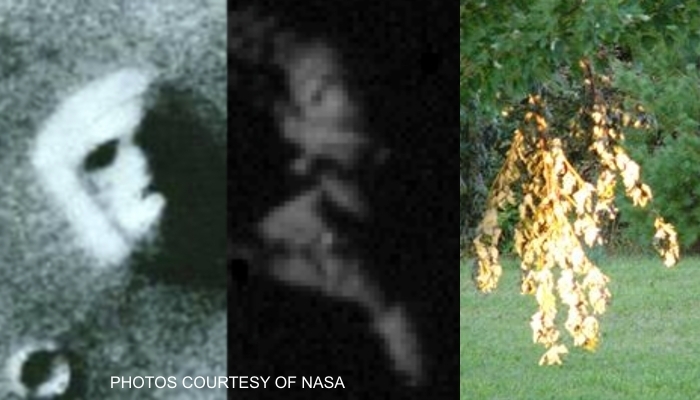 Look at these other NASA images taken later at higher resolution and different Sun angles. This is a huge topographic structure. The “Face” measures 1.5 x 1.2 miles, and is about 0.3 miles tall. That dwarfs the Great Pyramid at Giza, which measures a mere 0.14 miles per side. Building or sculpting that large a monument would leave traces of construction debris that are just not seen. The middle image shows what is called the “Frankenstein on Miranda,” a moon of the planet Uranus. You can even see the “bolt” in his neck. But as with the “Face,” it’s just natural random topography. What’s happening in all these cases is something psychologists call pareidolia. It’s a natural tendency of the human eye-brain system to recognize faces and human forms. We’re “hard wired” for that, as it has obvious advantages in terms of survival and natural selection … evolution at work. Apparently dogs experience this too. Seeing a face in a rough stucco wall, plastered ceiling, clouds, etc. is a common experience, like seeing the “Man in the Moon.” Tune your TV to a channel that shows only static snow, watch it for awhile, and your eye-brain system will start to detect patterns and shapes in the random noise. The same thing happens with sound. When you play speech or music backwards, which is easy to do in this digital age, some people claim they hear hidden messages. Our brains are wired to search for recognizable patterns, so just like they say “don’t believe everything you read,” neither should you believe everything you see.